In 2018 has been built vessel Elan Impression 50 named Andiamo. This vessel is placed in port Biograd around Zadar in Croatia. You can board up to 12 crew members on the vessel Andiamo. Configuration of sleeping places is 12 (10+1+1). There are 5 bedrooms situated below she's deck. Andiamo is equipped with 2 toilettes. Read about different yachts by opening this link here: Yacht charter Zadar. Diesel tank is 295.00 l liters capacious , water container has up to 605.00 l liters. In this yacht is applied motor 80 hp. 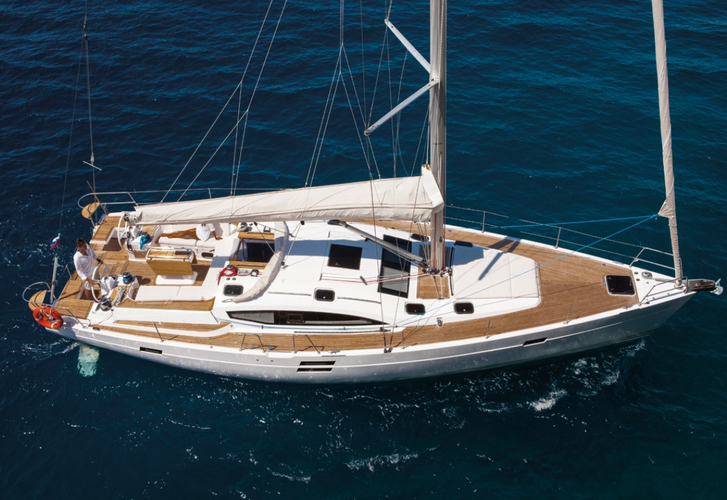 With 15.20 meters of LOA and 4.70 meters of beam Andiamo provides enough space for comfortable sailing. Elan Impression 50 Andiamo is equipped with: ipod system, Gps plotter, Plotter gps in cockpit, Autopilot, Gps, Furling mainsail, Freezer, Bow thruster, Anchor electric windlass, Bimini top, Dinghy, Air conditioning, CD/MP3/USB player, TV, Heating. . Nonrefundable caution has value 2500.00 EUR. Search for more yachts over here: Yacht charter Biograd.